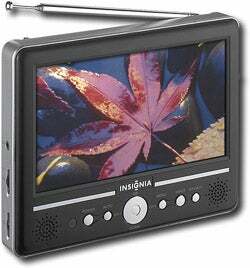 This 7-inch Insignia NS-7HTV is technically HDTV in the sense that yes, it does accept ATSC (the over the air HD signal). However, after receiving the signal the 7-inch TV displays the picture on its 480x234 pixel display. 480 x 234? That's not even the 480i that the manufacturer claims. 480i is usually 640x480, not 480 x 234. Unless we're mistaken (which we don't think we are), that's not 480i. In other words, the only reason why you would use this TV is if you really like watching TV on the go and you want to be prepared when analog broadcasts get shut down in 2009.